George Papadopoulos, the novice, unpaid foreign policy adviser to Donald Trump, who rose to prominence when he became the first former campaign adviser arrested as part of special counsel Robert Mueller’s Russian-influence probe, was sentenced Friday to 14 days incarceration, one year of supervised release, 200 hours of community service and $9,500 fine. Finally, Breen argued that Papadopoulos had paid a steep personal price. “Judge, he’s taken his pounding,” he said. Prosecutors, though, demanded he spend time behind bars, telling U.S. District Court Judge Randolph D. Moss that Papadopoulos continued to mislead them even after they had reached a cooperation agreement. Speaking for the special counsel's office, Andrew Goldstein said Papadopoulos "chose to lie again and again to advance his personal interests." His lies were "purposeful, calculated and caused harm to the investigation,” he said. Because of his “deliberate lies,” Goldstein said, FBI agents had to “painstakingly piece together facts” by combing through 100,000 emails and eight gigabytes of data. After taking a 15-minute recess, Judge Moss delivered the sentence. Papadopoulos remains a central figure in the probe into Russian meddling because he is believed to be the first Trump campaign adviser to be contacted by someone believed to be tied to the Russian government and told of hacked emails tied to Hillary Clinton’s campaign – information shared in April 2016, well before any pilfered material was published. How his cooperation influenced the direction and tenor of the Mueller probe, however, remains unclear. Prosecutors conducted four lengthy proffer sessions with him, according to court records. According to his court filings, the interviews included discussion of his interactions with a mysterious Maltese professor, Joseph Mifsud, who was believed to have ties to the Russian government, and his fleeting friendship with a Belarussian-born businessman who was making contact with numerous people in Trump’s orbit. Both men have since gone silent. 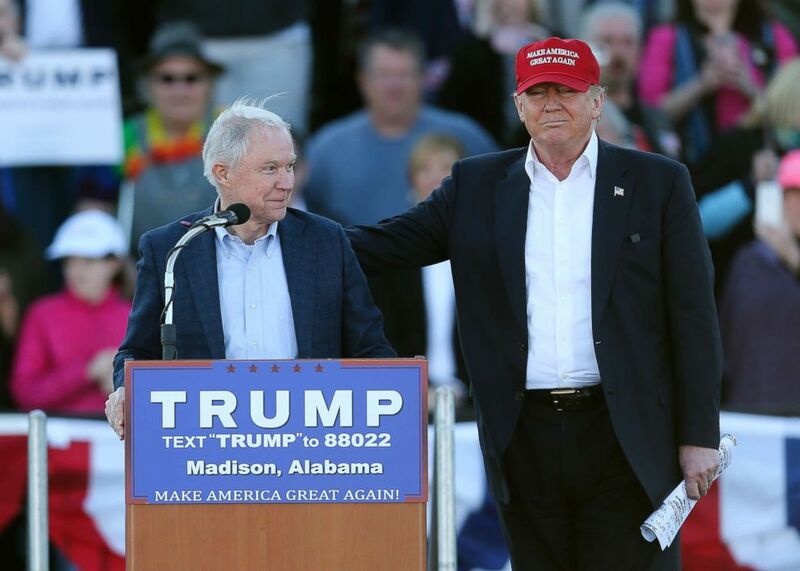 PHOTO:Donald Trump, right, stands next to Sen. Jeff Sessions, as Sessions speaks during a rally on Feb. 28, 2016, in Madison, Ala. In their sentencing memo to the judge released last Friday, lawyers for Papadopoulos also claimed the future president "nodded with approval" when, at a March 2016 meeting that included then-campaign adviser Jeff Sessions, Papadopoulos offered to arrange a get-together with Russian President Vladimir Putin. Trump has said previously he does not recall much of what was said during the "very unimportant" campaign meeting. In the months since his guilty plea, Papadopoulos has been represented in public by his wife, Simona Mangiante Papadopoulos. As her husband’s sentencing approached, Mangiante Papadopoulos has spoken out repeatedly about her belief that her husband was in some way set up by the government. For several weeks, she maintained that her husband was reconsidering his guilty plea. But she said he ultimately decided to accept his fate with the court.